The ISBN is the International Standard Book Number and is typically required to publish a printed book. It's 13 digit number, or 10 digits if it was assigned before 2007, uniquely identifies your cookbook. There are several ways to obtain an ISBN number for your book. 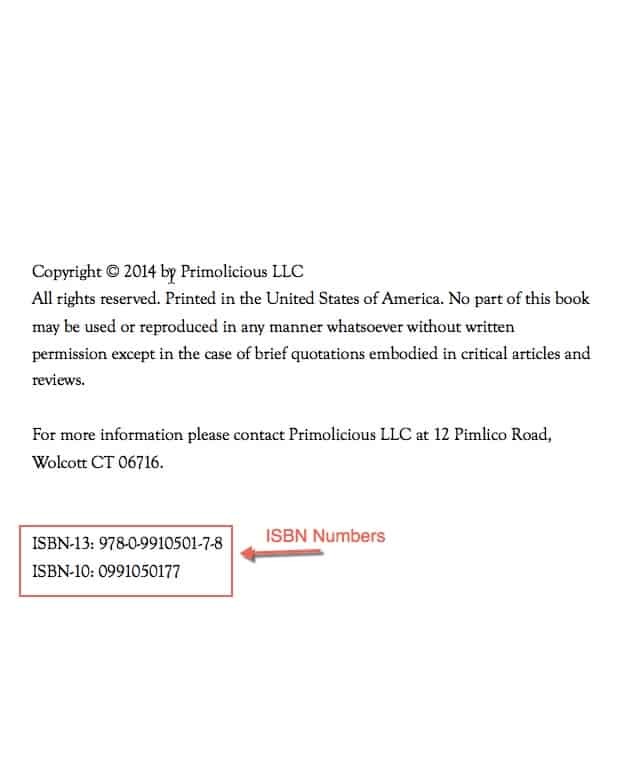 Some print-on-demand publishers will provide you an ISBN number free of charge. CreateSpace is one of these. Be aware though that using this free ISBN number may have some negative impacts as detailed below. You can purchase your own ISBN number from an ISBN company. There are several that you can use, depending on your location. The US company is My Identifiers, run by Bowker. You can get 1 ISBN number for $125 or if you are planning on doing multiple books, 10 for $295. If your ebook has an ISBN it needs to be different from the print version as well. The same is true for hardback and paperback versions, they would each need their own. When Do You Need an ISBN? You need an ISBN number if you are going to sell a printed book through almost any bookstore or retailer, either online or offline. If you are only going to be selling the book yourself then you usually don't need one. Some ebook retailers also require them but not Kindle, iTunes, or Nook. Kobo recommends using an ISBN number. If the book is an electronic book you can usually get away without using one. 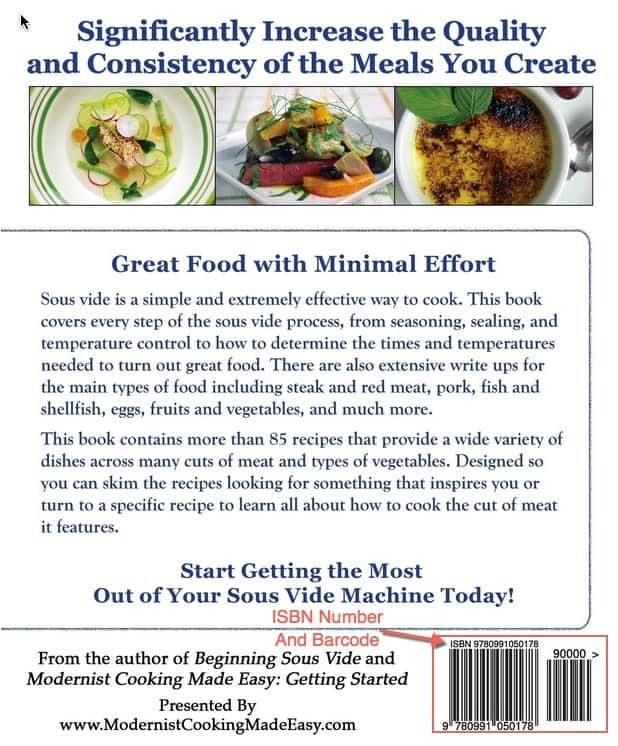 This is perhaps the most important reason for owning your cookbook's ISBN number. If you take advantage of a low-cost or free ISBN number provided by your POD publishing service company, they would be listed as the publisher. In most cases this would cause your book to be disregarded by many bookstores and reviewers as being a self published book. This may not be fair but it is unfortunately a fact of life in the book business. Moreover, if the publisher is listed as "CreateSpace" it gets even worse since Amazon is viewed as the enemy by many of the distributors you are trying to sell your book to. Since you are the publisher you are assured that any special orders for your books will have to go through you rather than being handled by another party. If your book takes off this could amount to a significant difference in your financial outcome. As the owner of the ISBN you control the metadata which is put into the Books in Print database. This metadata includes your book's description, cover image, and PDF file which librarians, reviewers, search engines, booksellers and the publishing industry at large use to find your book. As a publisher you can go to any printer you choose. If your book takes off you have the freedom to go to a short run or offset printer to reduce your costs and make more money from your book. We feel that making an investment in your own ISBN numbers is the correct strategy for most self published authors. The ISBN number is used in a few places. When you enter the information for your book for printing you will need to enter it into their form. You will also need it displayed on the back cover of your book, along with a bar code. Many printers do this automatically for you. The final place you need to put the ISBN number is on the Copyright page of your book.